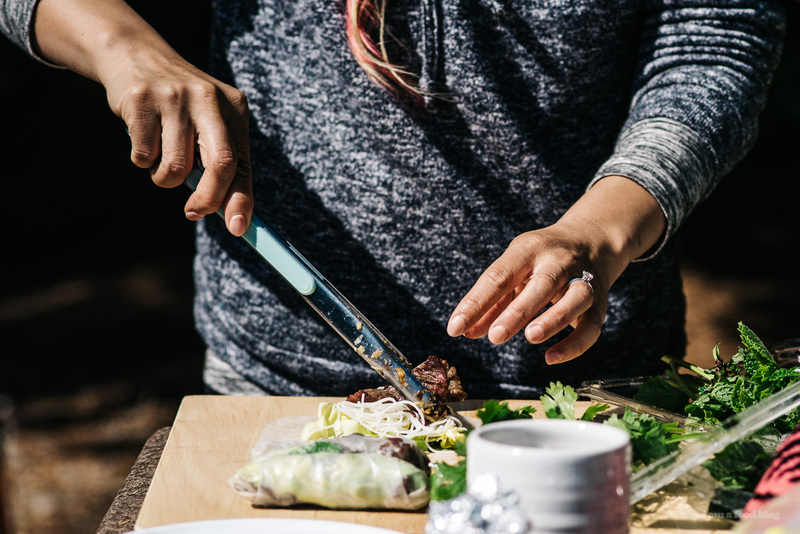 Camp food like you've never seen before: nom on these addictive lemongrass beef salad rolls! I’m reliving that camp life every time I look through our camp photos. 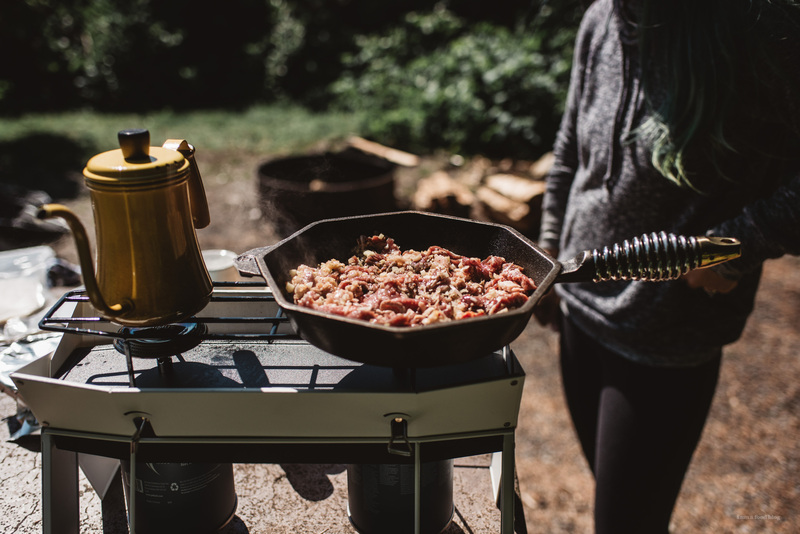 I miss cooking in the great outdoors! We’re definitely going to camp s’more this summer, we just need to get out butts in gear. I made these lemongrass beef salad rolls way back in May, when the sun came out after two days of camping in the rain. We definitely knew it would rain (it was in the forecast) so we brought along our rain boots, as precaution. What we didn’t expect was the torrential downpour that happened. We should have known, we do live in the Pacific Northwest, after all. There was absolutely nothing to do about it though, so we did what any good car campers did. We drove to the nearest town for some much needed breakfast. The closest town happened to be Forks – yes, of Twilight fame! I now know why those vampires live there – there is absolutely no sun. The rain poured down in sheets as we went to the most hip happening diner in town. I LOVE diners, especially for breakfast and this lil Forks place didn’t disappoint. Mike had chicken fried steak and I had a single piece of french toast with 2 strips of bacon and a sunny side up egg. It was just what we needed: a chance to dry out our soggy feet while filling our bellies with warm food. After breakfast there wasn’t much to do, so we went back to camp and spent the rest of that day chilling out in our tent, which is when Mike decided that he wanted a much, much bigger tent. 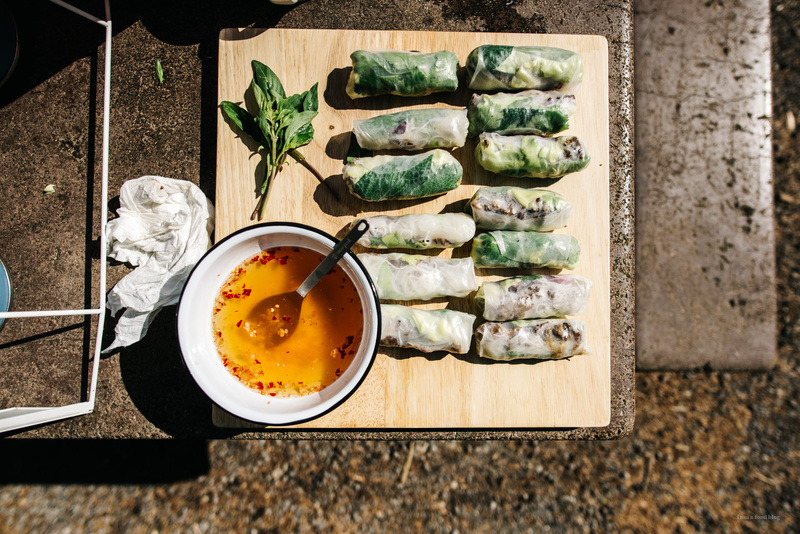 But, the next day the sun came out and we were able to dry off our shoes and I made us some decidedly summery Vietnamese lemongrass beef salad rolls. I guess salad rolls might sound like a crazy thing to make while camping (at least according to the friend I sent a photo to) but really, nothing could be simpler. 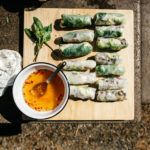 If you’re really prepared, you can have all of your veggies washed, vermicelli cooked, dipping sauce made, meat marinated and then all you have to do is fry and roll. Of course, I didn’t do any of that, because where’s the fun in being TOO prepared? 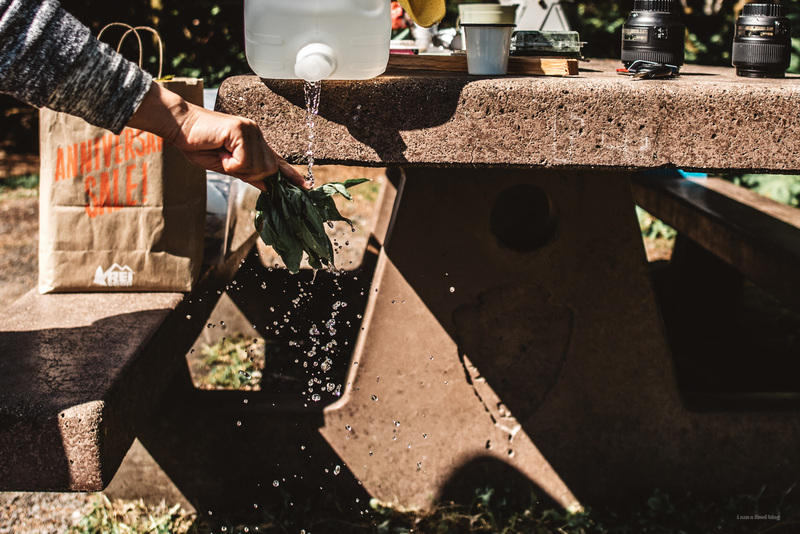 We did buy bagged salad, so that made everything boatloads easier because who brings a salad spinner while camping? But then again, who brings fish sauce camping (me!)? Usually, when making salad (or summer, or whatever you call them) rolls, most people will roll and eat as they go. 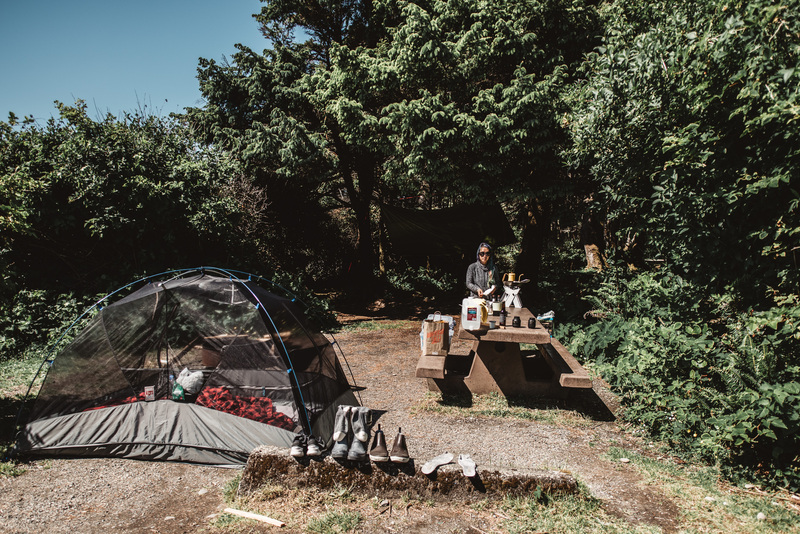 In this case, I just rolled all of them up beforehand so we could relax on our camp chairs and dip while our shoes (and tent, sans rainfly) dried out in the sun. These guys were so good that we made them again on another camping trip. Of course, you don’t need to go camping to enjoy them – they’re perfect picnic food! Hope today is a picnic day for you! 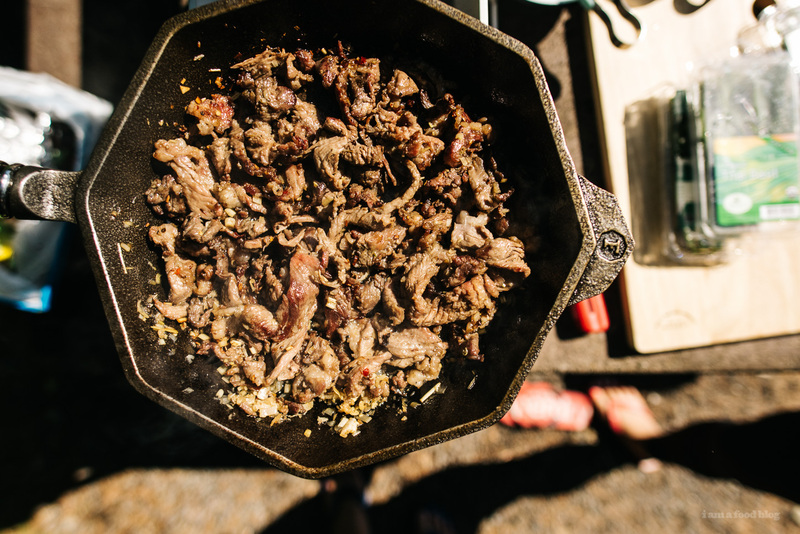 If you prepare most of your ingredients before heading out to your campsite, it’ll vastly increase your enjoyment of this recipe! Marinate the beef the night before. If you’re not planning on eating this on the first day, freeze it; it freezes well. 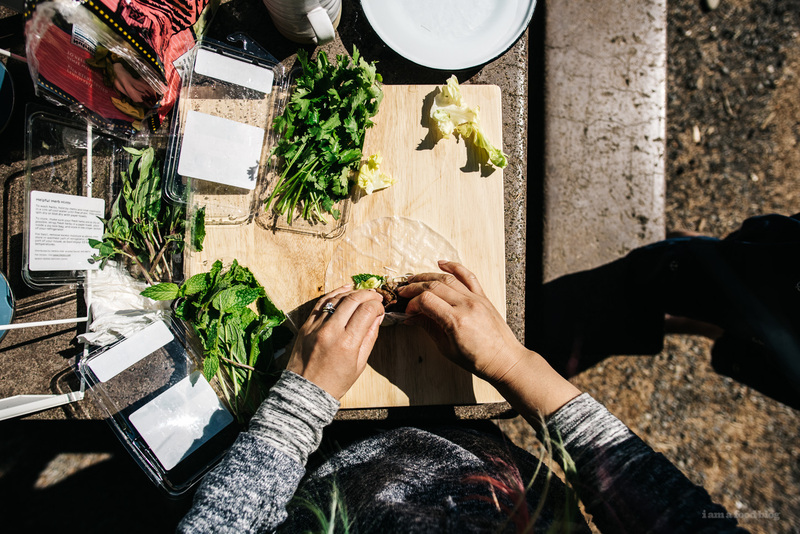 Wash and throughly dry the lettuces and herbs, keeping them fresh in ziplock bags in your cooler. You can also soak and drain the vermicelli and make the dipping sauce ahead of time as well. If you’re going do just one herb, I would choose mint. It’s the most hearty (cilantro definitely wilts the quickiest) and it adds that herb-y freshness that Vietnamese food is known for. Mix together all of the beef ingredients in a bowl. Let marinate while you make the dipping sauce. You can also prepare this at home and let it marinate overnight, tightly covered. Make the fish sauce: Crush the clove of garlic (either using a garlic press or the back of a spoon) into the sugar. Add the lime juice and water. Stir until the sugar is dissolved. Add the fish sauce, adjusting to taste. Cover and set aside. Bring water to a boil for the vermicelli and rice paper. Place the vermicelli into a bowl and pour the boiling water over it. Cover and let noodles soften while you’re cooking the beef. Pour the remaining hot water into a bowl and set aside. Heat up a cast iron pan over high heat. Add a touch of oil to the pan. Cook the beef, until crispy and brown, stirring occasionally, until caramelized and cooked through. Remove from the heat. Drain the vermicelli. Take a rice paper wrapper and completely submerge it in your bowl of hot water for 10-15 seconds. Place the wrapper on a plate or cutting board – it’ll continue to soften as your assembling your roll. Add fillings as desired: lettuce, herbs, vermicelli, lemongrass beef. Fold the bottom half of the wrapper up over the filling, hold the fold in place, fold in the sides and roll, much like a burrito. Repeat until all the rolls are made. Enjoy with the dipping sauce! Notes: I used bagged butter lettuce – it comes pre-washed, which makes making these rolls so much easier. We found little clamshells of all of the herbs (cilantro, Thai basil, mint) at a regular grocery store. Usually I buy herbs in bunches, but the little clamshells were just the right amount for us. I have so much love for the fact you are someone who takes fish sauce camping. forks is real?! glad it has something to offer besides just being a random town used in twilight. Spring rolls and twilight- what else do you need while camping? I’m going to channel you the next time I’m in a tent, and I’m going to make spring rolls very soon (probably not while in a tent, though). You know how to camp!! 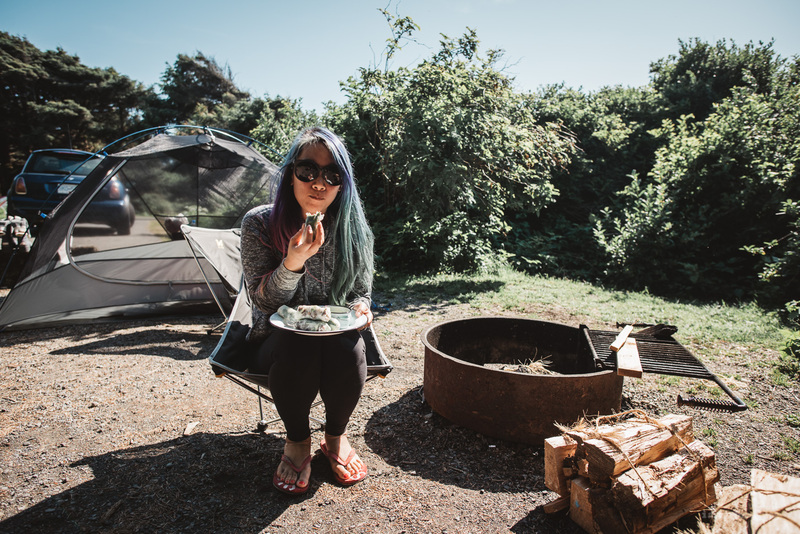 I’ll go camping anytime if I know there are salad rolls involved. Looks yum! These sucked so bad… just kidding, I ate them all before one could leave the kitchen. 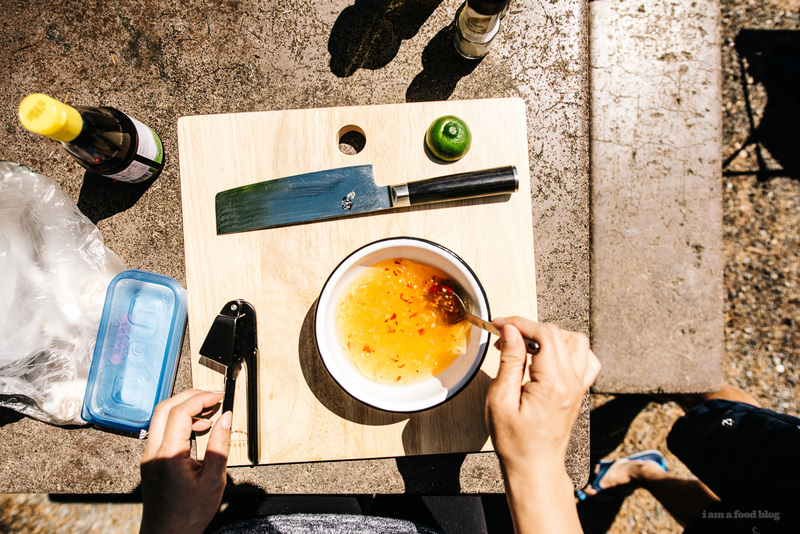 Way late, but does anybody know what knife that is in the fish sauce picture? Are these the clear vermicelli noodles?